It has been active in the United States and Canada since 1931, has been approved by the last 6 Popes, and was endorsed by the Second Vatican Council. The main purpose of the Legion of Mary is to give glory to God through the sanctification of its members. AUXILIARY members, the praying wing of the Legion of Mary, are lay faithful, priests, or religious unable to assume the duties of active membership. They recite daily the prayers of the Tessera, namely: the Invocation and prayers of the Holy Spirit, 5 decades of the Rosary, the Catena, and the prayers described as 'concluding prayers'. Auxiliary members are contacted at least once a year by active members of their attached praesidium. An invitation is extended to Acies, the annual ceremony of re-consecration to Mary, Queen of the Legion, held around March 25th, the Annunciation. Auxiliaries are honored with a special function around September 8th, the birth of Our Blessed Mother. Our praesidium is called Our Lady, Queen of Heaven & Earth and our meetings are held every Tuesday at 7:00 p.m. in a room in our church basement. Come and join us for faith sharing, prayer and great company! Fourth, absolute respect for the confidential nature of many matters discussed at the meeting or learned in connection with the legionary work." For more information, ask any member of the Legion of Mary or contact the parish office to obtain the name and telephone number of a point of contact for the nearest Legion of Mary Praesidium. Come, 0 Holy Spirit, fill the hearts of Your faithful, and enkindle in them the fire of Your love. v. Send forth Your Spirit, 0 Lord, and they shall be created. Let us pray. God our Father, pour out the gifts of Your Holy Spirit on the world. You sent the Spirit on Your Church to begin the teaching of the gospel: now let the, Spirit continue to work in the world through the hearts of all who believe. Through Christ our Lord. Amen. v. You, 0 Lord, will open my lips. v. Incline unto my aid, 0 God. R. 0 Lord, make haste to help me. Hail, holy Queen, Mother of Mercy; hail, our life, our sweetness and our hope. To you we cry, poor banished children of Eve, to you we send up our sighs, mourning and weeping in this valley of tears. Turn then, 0 most gracious advocate, your eyes of mercy towards us, and after this our exile, show us the blessed fruit of your womb, Jesus. 0 clement, 0 loving, 0 sweet Virgin Mary. 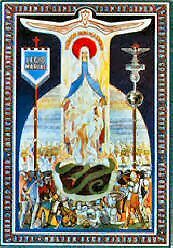 v. Pray for us, 0 holy Mother of God. Let us pray. 0 God, Whose only-begotten Son, by His life, death and resurrection, has purchased for us the rewards of eternal salvation; grant, we beseech You, that meditating upon these mysteries in the most holy Rosary of the Blessed Virgin Mary, we may imitate what they contain, and obtain what they promise. Through the same Christ our Lord. Amen. R. My spirit rejoices in God my Saviour. v. 0 Mary, conceived without sin. Let us pray. 0 Lord Jesus Christ, our mediator with the Father, Who has been Pleased to appoint the Most Blessed Virgin, Your mother, to be our mother also, and our mediatrix with You, mercifully grant that whoever comes to You seeking Your favours may rejoice to receive all of them through her. Amen. We fly to your patronage, 0 holy Mother of God; despise not our prayers in our necessities, but ever deliver us from all dangers, 0 glorious and blessed Virgin. Confer, 0 Lord, on us, who serve beneath the standard of Mary, that fullness of faith in You and trust in her, to which it is given to conquer the world. Grant us a lively faith, animated by charity, which will enable us to perform all our actions from the motive of pure love of You, and ever to see You and serve You in our neighbor; a faith, firm and immovable as a rock, through which we shall rest tranquil and steadfast amid the crosses, toils and disappointments of life; a courageous faith which will inspire us to undertake and carry out without hesitation great things for your glory and for the salvation of souls; a faith which will be our Legion's Pillar of Fire - to lead us forth united - to kindle everywhere the fires of divine love - to enlighten those who are in darkness and in the shadow of death - to inflame those who are lukewarm - to bring back life to those who are dead in sin; and which will guide our own feet in the way of peace; so that - the battle of life over - our Legion may reassemble, without the loss of any one, in the kingdom of Your love and glory. Amen. In the name of the Father, etc..